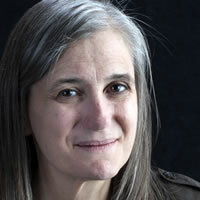 Amy Goodman is an award-winning investigative journalist and syndicated columnist, author, and host and executive producer of the daily, independent global news hour Democracy Now! which airs on more than 1,200 public television and radio stations worldwide. Goodman has interviewed several Lannan guests including Noam Chomsky, Eduardo Galeano, and Robert Fisk. Her newest book, The Silenced Majority: Stories of Uprisings, Occupations, Resistance, and Hope, written with Denis Moynihan, gives voice to the many ordinary people standing up to corporate and government power—and refusing to be silent. Democracy Now! airs locally on KSFR 101.1FM Monday-Friday from 6-7am and from 3-4pm, on KUNM 90.7FM Monday-Friday from 4-5pm, and on Free Speech TV, channel 9415 of the DISH Network Monday-Friday at 6am, 5pm, and 10pm. "Hiroshima and Nagasaki, 69 Years Later" article written by Goodman on "Truthdig"
"A Venerable Jewish Voice for Peace" article written by Goodman on "Truthdig"